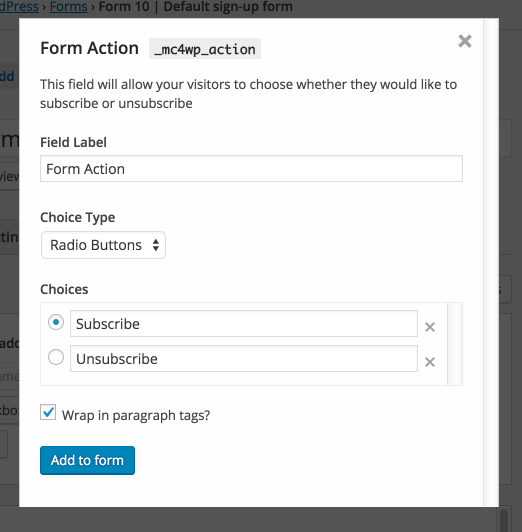 Since version 2.7 of MailChimp for WordPress, you can use the plugin forms for handling unsubscribes straight from your WordPress site. This can be beneficial since that means you no longer have to direct your visitors to the unbranded MailChimp page for them to unsubscribe from your list. Even more, you can try your best to convince them to stay. We have several options when it comes to integrating unsubscribe functionality in your forms. In most cases, you will want a subscribe-only form visible prominently on your blog, while having an unsubscribe form on a dedicated page. To accomplish this, create a new form and include the following hidden field. Another option is to have your visitors choose whether they want to subscribe or unsubscribe. To do that, create a new form (or edit an existing one). At the top of the page, you should see "Form Action" as one of the available fields to add to your form. Clicking on that form will open up an overlay where you can customize what your visitors will see. When you're done editing, click the "Add to form" button and you're all set!